Fully topped up, the F-22 Raptor can carry a lot of fuel. Even saying it can carry “a ton” of fuel is incorrect, because technically, it can carry nine tons of fuel, or 18,000 pounds, according to builder Lockheed Martin. That means it can take a bit of time to fill up in the sky, so the pilots and the aircrew that fuel them get to talking. Mostly about stars, and cookies, and stuff. 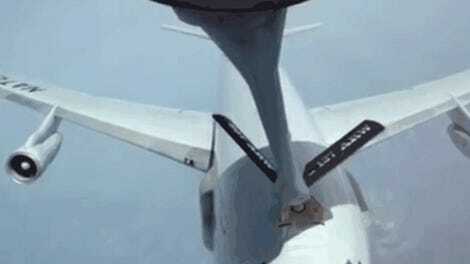 The refueler on the big tanker and the pilot of the fighter jet need to be able to talk to each other to ensure that the fuel boom nestles right in the fuel receptacle of the receiving plane, and you don’t get fuel spraying everywhere or worse. But once the hookup is complete, there’s not much more to do than maintain position and chew the fat. Senior Airman Jordan Smith, out of Travis Air Force Base, is a refueler on a KC-10, and is not only known for his skills at cooking Sky Pizza, but also for his amiable banter with pilots, according to the Department of Defense. They talk about making cookies onboard, the seating position for the refueler on the KC-10 (as opposed to the weird prone position on the other U.S. Air Force re-fueling mainstay, the KC-135), and of course, chicken. Sometimes they even exchange riddles and jokes. You always thought that fighter pilots just said Cool Things, like “FOX THREE” and “BANDIT ON YOUR SIX” and lots of other things involving words and numbers, but no. A lot of it is just sitting in a plane, with no in-flight entertainment and no getting up to walk to the bathroom. You’d start staring at the stars, too.